Canyonlands National Park, Utah, April 14, 2004. 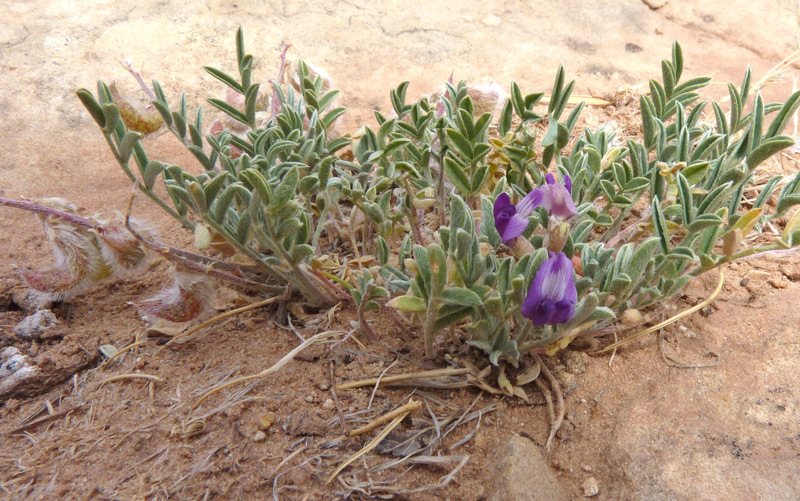 This delicate beauty is very easy to spot because the brilliant shades of pink/blue/purple flowers stand out against the sand and rock that the plant inhabits. 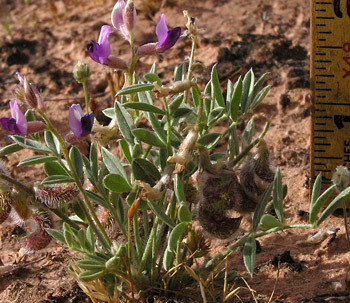 Plants range from one to seven inches tall. Click to see a comparison of A. desperatus with the very similar A. nuttallianus and A. naturitensis. Butler Wash, May 2, 2007. 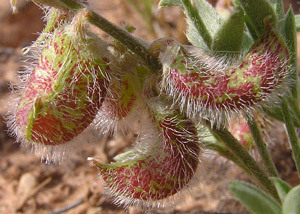 Glowingly hairy, mottled green seed pods curl and are about a half inch long. 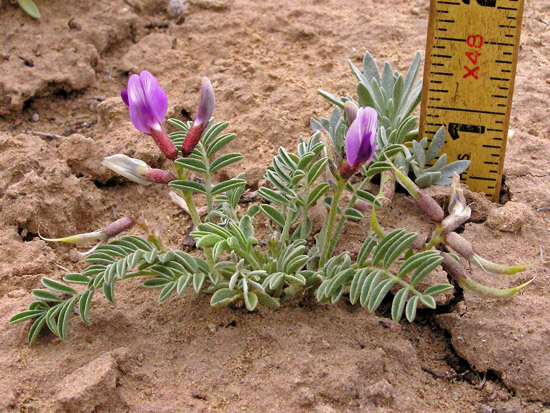 "Desperatus" is one of the more humorous scientific plant names: Marcus Jones, who collected the plant near Cisco, Utah in 1890 and named it in 1891, was "desperate" to find a name not already used in the huge Astragalus genus. New Mexico, April 24, 2007. 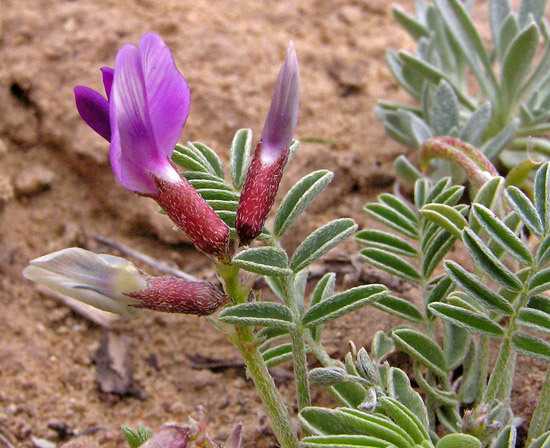 Astragalus monumentalis variety cottamii, A. desperatus, A. monumentalis, and A. naturitensis are similar in their habitat, size, flower color, pod size, and scarcity. All are easily overlooked. 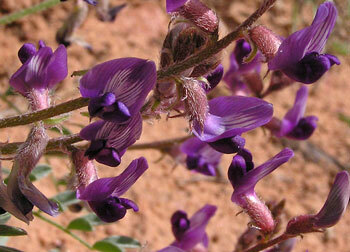 Astragalus monumentalis variety cottamii is found only in the Four Corners area and is listed as rare. 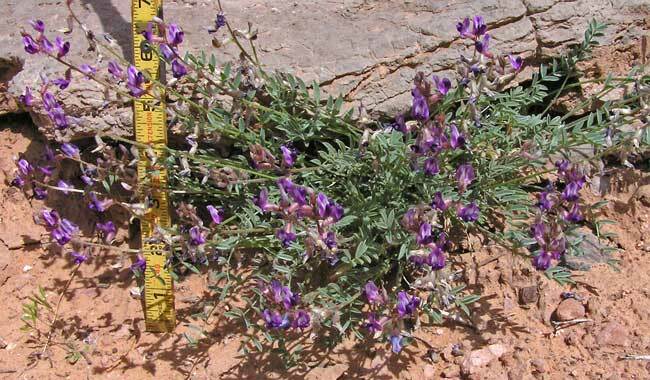 Leaves are hairy, flowers range from pink to purple, and the pods are curved and often purple speckled (look below the ruler for young pods and just to the left of the ruler for a more mature, speckled pod). 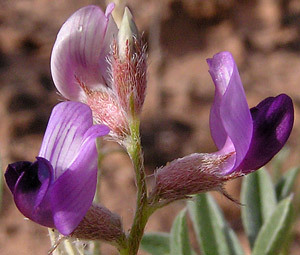 Plants are from one-half to three inches tall.